Then I heard a re-interpretation of this golden rule. Write WHO you know. This didn’t mean literally write about my family and friends, it meant write about the sort of people you know. That makes sense – I know nothing about how the rich and famous or the aristocracy might go about their daily lives, but I do know about life in the back streets of small towns in the sixties and seventies and the people who worked 9-6 to make a living. I know about village life and the family bonds that make up a small community. I know about the countryside and farming, and the tough folk of wild west Wales who eke out a living surrounded by the sea and moorland. I know about painting. What is more important, I’ve always had an insatiable curiosity, a will to learn, and a huge blind spot about what I can’t do. I realised upon writing my first novel that life had bequeathed me a wealth of emotional baggage, and while that is a daily pain for me, for a novelist, it’s a gift from God, or rather a gift from all those who have shat upon me throughout my life. For that, I must be grateful. I know the pain of rejection and loss. I know how tenuous happiness is, how life can change upon a throw of a dice in someone else’s hand, and how the best of decisions can be regretted. I know fear, guilt, misery, longing, and anger. I’ve been to the very edge and returned, wiser but not unscathed. That’s better – good to get that out. Writing is nothing if not cathartic. I also know love, joy, happiness, relief, fulfillment, and contentment. There are two sides to every coin and two sides to every tale, just as there are two faces to every person and snakes have forked tongues. We are imperfect, flawed by our genetic makeup, our nurture, and what life throws at us, and that is also a gift for a novelist. So I found to my delight that I can invent ‘real’ characters who are plagued by guilt, as Walt is in Touching the Wire and Ella is in the For Their Country’s Good trilogy. Characters who, like Ella, make the wrong choices or who are selfish and self-centred like Alana in The Silence of the Stones. Or characters like Abe in Where Hope Dares who is forced to re-evaluate a long life and make a decision that goes against his life’s mission and all he’s been taught. Characters who have one thing in common, a quality that has both plagued and enriched my life – the gift or curse of unbreakable love. Putting those characters into a setting reawakened my love of learning. Researching the places and situations, the eras, and the social and religious constricts is something I find a joy. The first novel I published, The Silence of the Stones, was written about the time and place in which I live, so it was relatively easy to research. I didn’t know when I began it that I would wander the minds of people suffering from Disassociative Identity Disorder – if you’re interested in that fascinating and disturbing subject there is an excellent book Fractured by Ruth Dee, which I highly recommend. I didn’t know that I would study the runes of the Elder FuTHark and actually perform rune castings using Scrabble tiles to progress the story. The castings were at times spookily accurate regarding the characters and plot. Where Hope Dares is a little different from my other novels in that it centres around an ideology rather than a place, situation, or people. It’s a fantasy, a dystopian, if you like, set far in our future – it raises questions about many of the concerns of our time and how they might affect the future of mankind and our planet, but it’s written from the heart of one who loves planet Earth with a passion, even if she doesn’t always much like the species that are defiling it. It’s not everyone’s cup of tea, but it was the first novel I ever wrote, and it’s very special to me. It’s a tale of courage and hope and unbreakable love: in that, it has a common theme with my other work. I knew little about the Holocaust before I wrote Touching the Wire. This was the most difficult book to research and write. The horrors of Auschwitz gave me nightmares and there were many times when I had to walk away and give myself time to breathe. But the victims couldn’t walk away, and if they breathed, it might be to inhale gas. The more I researched and wrote, the more I cried, and the more convinced I was that this was a story that must be told – but what right had I to tell it? Could I do it justice? I wrestled with this for some time, but I realised that I knew abject misery, fear, loss, guilt, longing, and anger all too well, and could connect to these ordinary women, women like me, for whom someone else had thrown the dice. My characters demanded their story be told – being too cowardly to tell it was a worse affront to the courage, faith, and hope of the women of Auschwitz than anything I might write that was incorrect or dubious in other respects. I plucked up my dwindling courage and pressed publish. The messages I have received from survivors of the Holocaust have shown me that pressing that button was the right decision. Life in Victorian England and transportation to the penal colonies of Australia were also subjects I knew little about, but my family history had whispered tales of a poacher transported for killing a gamekeeper. There had to be a story in there, didn’t there? I rooted it out, and I found I knew these people. They were family, dead long before my time, but my grandmother would have known of them, and I knew my grandmother and her life and family. Writing For Their Country’s Good was a joy. I connected with Jem and Ella through strong family bonds and a common heritage. The tale grew from the one novel I’d intended to a three-book series. The more I researched, the more the story grew; I was writing about WHO I knew, and I learnt much about myself in the process. For me, it was a fascinating journey. I hope it is for you, too. This second golden rule holds true for my latest offering, The Dandelion Clock, due out in 2018. Again, it’s inspired by my family history, this time my grandfather and his time serving in Egypt and the Holy Land in the Great War. What did I know about the Great War? Sweet FA – that’s Fanny Adams, by the way: a more polite rendering, but it amounts to the same thing – but I did know my grandparents. I was extremely fortunate to find two amazing books, without which I doubt my novel could have been written. Fighting for the Bucks by E.J. Hounslow and Diary of a Yeomanry MO by Captain O Teichman. I know a hell of a lot more about the war in Egypt and Palestine now, and it was a real eye-opener. The Dandelion Clock is the war as winessed by a young private of the Queens’ Own Worcester Yeomanry, a boot-last maker from Kettering, who goes off to war with his brother and their horses, leaving behind the girl he’s promised to marry – my grandmother. I expect it’s the story of many a young couple torn apart by war. So, what can you take from this as a writer or someone who’d like to write? It’s not what you know but who you know! 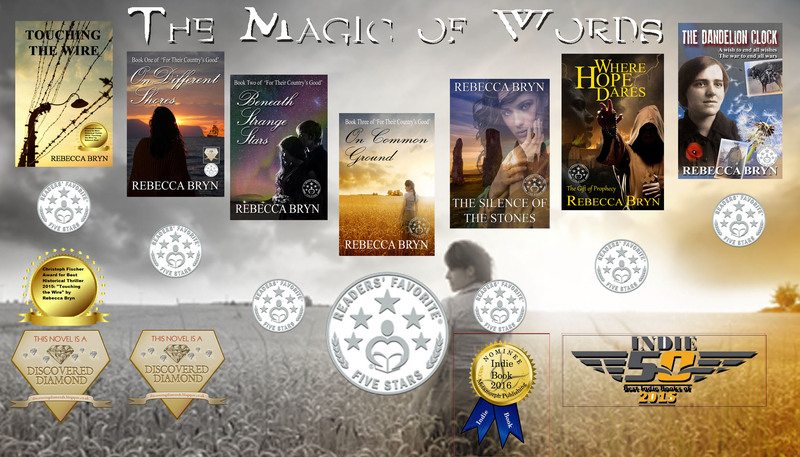 The what can be researched, discovered, or fantasised: the who comes from the honesty deep inside you, and it’s this part of you that connects you, through your characters, with your readers. What did she mean by that? Passably remarkable? I think you’re very remarkable. WordPress needs a “Love” button for posts like this. I’m sharing it on my site. Thank you, Lucinda. Much appreciated. Thank you for the reblog, Mary! Much appreciated. Now if that doesn’t make you want to read an author’s books, nothing will. Thanks, Lucinda, for putting us in the picture. I hope you find something you enjoy, Ann.